I’m just going to go with the flow, and keep posting games for as long as it seems practical and interesting. The first few I mentioned have yielded as many more, and it seems the only way to navigate this maelstrom of games is to ride it out to the logical end. And I don’t have a problem with that. It’s the time of year when a few extra games would be welcome, and I mostly have enough time to handle them all. Here’s another zombie-themed ditty, aptly named zombies!. zombies! bills itself as a zombie roguelike, but it might have more in common with robohack or robots than rogue. It does have a top-down perspective, you have a preset number of HP (“hit points,” I presume) and your central character is an atpersand, but after that, its roguelike pedigree is going to depend on your interpretation of the genre. Trees are hash marks, zombies are capital Z characters, and gold is the dollar sign. Teleporters are caret marks and each level has an exit in a greater-than sign. Everybody moves one space at a time, in any of the eight directions. When a zombie touches you, you lose a hit point. Lose them all, and the game is over. That’s the crux of zombies! though, and as you might guess, it’s more of an endurance game than anything. There’s only one ending, you never find an Orb of Zot or an Amulet of Yendor, and unless you’re an archmage of ASCII, you’ll probably get run down at some point. So your score is a tripartite report on how long you could keep running, to what level and to what profit. I have a few complaints about zombies! that I must, of course, vocalize. And oddly, the biggest issue I had with it was color … or the lack thereof. Ordinarily I can gloss over an omission like that, but this time it’s an issue of visibility. I literally have to hunt across the 80×20 or whatever grid just to find my own symbol, and that’s a problem each time I start a game, change levels or teleport. Teleporters, by the way, don’t always move you out of danger, which isn’t a complaint, but they do seem to trigger a screen artifact each time I use one. That’s usually painted over in the next move, but you’ll see it too, probably. Movement is with HJKL and YUBN as the eight cardinal directions, which I still find counterintuitive, even knowing outright what keys will move me where. It’s that half-second pause to think about the direction and find the key that annoys me. Arrow keys or a number pad arrangement would be so much nicer. The game won’t let you move onto a zombie, which is good, but also means it’s possible to be boxed in by zombies and trees in all eight directions. From there I could find no escape except to quit outright. A final note: The game field is set for 80×24 and will run in larger dimensions (but not smaller). 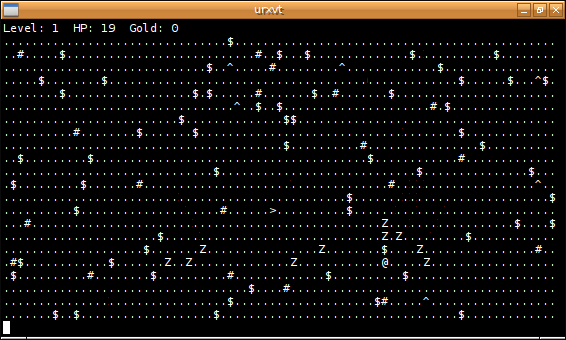 Level changes will not quite scroll correctly in bigger arrays though, and will leave half of the previous level hanging from the upper border of your terminal. A minor complaint. This entry was posted in Linux and tagged game on 2014/12/01 by K.Mandla.